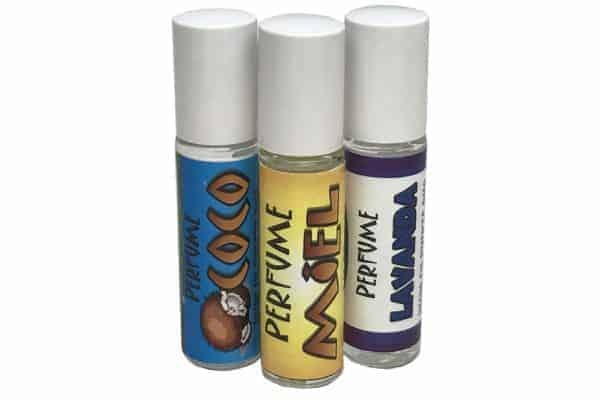 Prepared with essential oils or fragrances and blended with sweet almond oil and vitamin E. These perfumes are mild on the skin and last a long time. We do not use alcohol. Nag Champa – With the popular long lasting fragrance from India. Our best seller. Coconut – With virgin organic coconut as its base. Lavender – Relaxing aroma of the essential oil. A stress reliever. Sandalwood – Sensual aroma. With a touch of the expensive essential oil of sandalwood. Patchouly – An earthy fragrance only the essential oil can provide. Ylang-Ylang – Sweet floral aroma. Used in many perfumes. Said to be relaxing. Rose – Very true to the real thing! Long lasting fragrance. Jasmine – Floral aroma. A request from our customers.